The past decade has seen a growing trend of private investment in education. Private money has been flowing into everything from school start-ups and acquisitions to education services (e.g., administrative services, marketing, recruitment), education technology, professional training, and, increasingly, the provision and management of student housing. Private investment in student housing – both on-campus and off, and both independently and in partnership with schools – is growing by leaps and bounds for two reasons. The first is that institutions, banks, and private developers see the potential for good returns given the profound imbalance in supply and demand in student housing that exists in many markets. Simply put, there are not enough beds to meet the needs of growing populations of students in many places around the world. Accommodation is one of the biggest costs associated with studying away from home, and is therefore an area students and their parents will look at carefully when deciding between institutions and locations. This may be particularly true when two institutions are comparable on other measures, but one stands out for the quality, comfort, or innovativeness of housing available to students. This is especially the case for international students, who are not only living far from home but also surrounded by new cultures and languages. Safe, comfortable, and affordable housing is a must – both for the peace of mind of students and their families but also for academic success. Whether a student is domestic or international, housing is a significant element of their study experience. Indeed, as many international educators know well, problems with accommodations can overshadow an otherwise exceptional programme, classroom, or campus. Students come to school to study, but they also carry hopes of having a great life experience, and it is difficult to achieve the latter without a comfortable, safe, and affordable place to live. Some housing providers and institutions are taking this further by stepping up the accommodation offer with distinctive amenities or features, while others are targeting specific student needs or preferences. For example, University College Cork in Ireland offers an alcohol-free dormitory for those who prefer the option, including any students whose cultures require them to abstain from alcohol. The purpose-built student housing complexes and apartments that are increasingly being opened by private developers all over the world do not look like the school dormitories of yesteryear. They are larger in scale, and most are meant to be lifestyle communities able to accommodate large numbers of students. The Foundation notes that it is mainly the bigger properties and developments that attract such investor interest – “portfolios of 2,000 to 4,000 units” – and in larger cities where demand for student housing is higher. Adding a further international dimension to the trend, such investments are increasingly made by multinational firms. Private investments in student housing in the UK, for instance, are said to come mainly from North America and increasingly, Asia and the Middle East. Picking up on this point, the following illustration maps a spectrum of student housing investment in different markets around the world, ranging from examples of those that are “least mature” (which generally indicates an absence of purpose-built student housing) to “most mature,” where targeted, investor-backed housing for students is more common. The evolution of the student housing market. Source: Class of 2020. Please note that the term “REIT” in the illustration above refers to Real Estate Investment Trust, a large-scale property investment fund that is analogous to a mutual fund in stock or bond markets. As some markets, notably the US and UK, continue to mature, private operators and investors are now expanding their operations elsewhere. 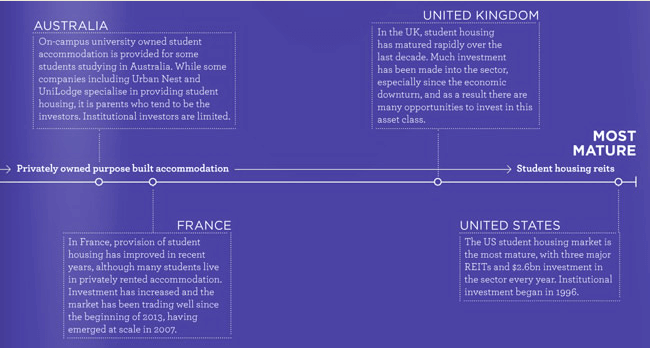 The European Union as a whole is seeing more private investment in student housing. Yet Wouter Onclin, foundation manager of the Class of 2020, notes a continuing shortage of student housing in many EU cities. Meanwhile, the pace of investment in Australia is also picking up dramatically, thanks to a situation where, according to The Australian Financial Review (AFR) only 54,000 purpose-built student bedrooms are available for the 1.2 million students enrolled in Australian higher education. “With tertiary education being a key anchor of Australia’s economy, continued growth of international students from Asia and chronic shortage of purpose-built student accommodation, we strongly believe the sector provides superior risk-adjusted returns potential and is poised to become a mainstream asset class in the coming years,” added APG’s head of private real ­estate investments in the Asia Pacific, Sachin Doshi, in a recent interview with The Australian. Other big players include Blue Sky (building 5,000 student beds over the next two years, in Brisbane, Melbourne, and Adelaide); Unilodge (with 11,480 managed beds in Australia and New Zealand), and the multinational Campus Living Villages. All of these property developers and managers are acquiring real estate as close to school campuses as possible and they are building big. UniLodge’s CEO, Peter Bates, meanwhile, recently told AFR he expects his business will double within five years. The Class of 2020 annual report makes reference to the fact that The Bologna Declaration has standardised many higher education programmes in Europe. Indeed, this is a key point: as programmes do become more standardised – think of the language school sector where commoditisation of general language courses is more and more of an issue – schools are obliged to compete on different dimensions. Regardless of the degree of harmonisation or differentiation in programme offerings, there is an increasing awareness among educators of how key aspects of the student experience – including housing – can each represent an important source of competitive advantage. The Class of 2020 notes that the student housing sector may take on characteristics of the hotel market, where consumers come to know and trust big brands. Certainly right now, there is a race among multinational property investors and managers to claim their stake in the housing space. And it may not be so far in the future that students come to know prominent accommodation brands and choose accordingly. This entry was posted in Africa, Asia, Australia, Australia/Oceania, Europe, France, Germany, Higher Education, Ireland, Italy, Japan, Middle East, Netherlands, North America, Regions, Singapore, South & Central America, Sweden, United Kingdom, United States and tagged postgraduate student recruitment, student recruitment, student enrolment, student affairs, language schools.